Last month, our little boy William turned two. The passing of time is such a funny thing: I found myself reflecting upon how quickly the two years had passed and yet at the same time; how I find it hard to remember the time before he was born. I suppose quite a lot has happened in these two years, we’ve conceived, grown and given birth to a whole new baby since then, so that does tend to throw a weird perspective on things. 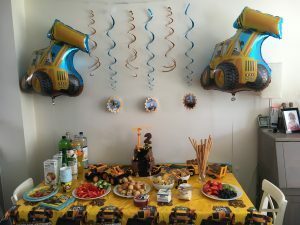 In our house, we’ve always thrown parties for our children’s birthdays, but kept it just to family guests as I feel like there’s plenty of years to come for big birthday parties with all their class mates and our house is really not big enough to have everyone. But what I will admit to is; I get a little bit excited and carried away when it comes to kids parties. And before you know it, you’re hosting a full on themed party and now, it’s become expected of me. 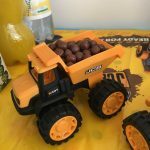 William’s birthday was no exception and he’s definitely a little boy who knows what he likes and he had no difficulty in telling me he wanted a ‘digger party’! 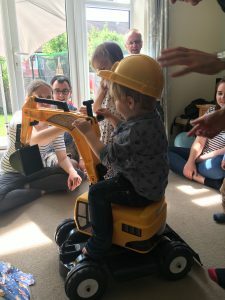 True to the stereotype, William does tend to love anything with wheels and his ultimate favourites are tractors and diggers so it was no surprise when he came up with the idea of a digger party. I, true to form, obliged and got on with some internet shopping to wow our little digger-obsessed toddler. Hopefully the photos below might give you some inspiration for your next party. The table was our focal point of the party, which gives a great ‘wow factor’ at the same time as being quite simple to put together. 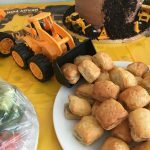 I ordered a table cloth, napkins, cups, plates and swirly decorations from the ‘Joey JCB’ range, which you can find quite easily from numerous places. I got ours from Amazon. Then by the time you’ve loaded the table with tasty treats and of course, the birthday cake, you have quite an impressive spread. With a newborn baby in tow, I wanted to keep the food simple to save time and stress so I opted to provide some fresh fruit and vegetable nibbles and dips, some crisps and then a selection of (pre-bought!) cakes. 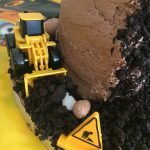 I made the food look more exciting by making use of William’s toy digger collection. This was really easy to do, didn’t take very long but made people comment on my creative use of plastic construction vehicles! 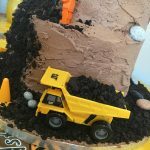 Fortunately, digger cakes are pretty easy to do because you actually want the icing to look messy and the cake to be a bit higgledy piggledy, after all, it is supposed to look like a construction site. If you’d like to see cake tutorials from me in the future, please let me know in the comments and I’ll try and remember to grab some photos during the baking process. But basically, this cake is a two tiered chocolate cake, smothered in chocolate butter cream and then covered in crushed up chocolate Oreos to make the ‘soil’. 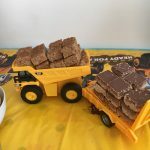 For added effect, I bought some chocolate ‘stones’, again from Amazon, and then popped on some Lego construction workers and yet more toy diggers. 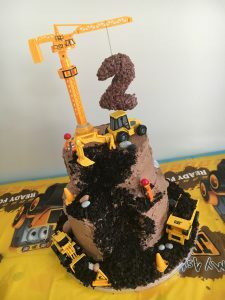 The cake topper is a ‘2’ made using the Rice Krispie treat method, only I used Coco Pops to make it look more mud-like! Concentrate on one key focal point (ours is usually the table where the cake and food are placed) as this generally gives the ‘wow factor’ without having to cover the entire room in decorations. Invest in a couple of big helium balloons – little children just love big balloons and they’re quick and easy for the amount of impact they have. Buy disposable everything. There’s nothing worse than having a mountain of clearing up to do at the end of a kid’s party so being able to bundle up the tablecloth, plates and cups makes life a lot easier. Keep the food simple – plan to provide things that can be prepared in advance or that are simple to do once the guests are there. There’s nothing worse than being stuck in the kitchen when all your guests are enjoying themselves without you. Take the children out whilst you’re preparing if possible. Or organise the party to be just after a nap, meaning you have a couple of hours clear to get the house ship shape and decorated and the children are fresh and awake for their guests. Of course naps don’t always work if it’s for older children but if a family member can take them to the local park for an hour etc then it really does help. I hope that’s given you some inspiration if you’re hosting a child’s party soon. They’re great fun to put together and the needn’t take forever to set up. 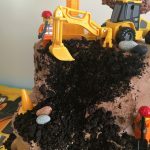 If you’ve held a digger party too, I’d love to see your photos, so just send me a quick comment or send me a link to your blog and I’ll take a look. You are genius!!! I LOVE the ‘2’ idea on the crane!!! So are you saying instead of making rice crispy treats you made cocoa puff treats? With the same recipe? Or did you make rice crispy treats, frost them, and cover in cocoa puffs?